The Little Red Umbrella: A Doctor Who Mystery: Is Tasha Lem River Song? A Doctor Who Mystery: Is Tasha Lem River Song? [Spoilers for the Christmas special] There was a brand new character introduced during this year's Doctor Who Christmas special: Tasha Lem, the Mother Superious of the Papal Mainframe (or, as Clara put it, "boss of the psycho nuns"). 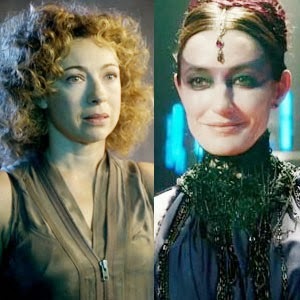 In the wake of the episode, there's been lots of speculation that Lem might be a version of the Doctor's wife, River Song. And with good reason. "The Time of the Doctor" was littered with clues suggesting the two might be the same person. 1. For one thing, there's her flirtatious relationship with the Doctor. She talks to him in much the same way River does — even calls him "Babes" — which is not exactly the kind of relationship he has with most people. In fact, her general attitude and many of her mannerisms seem awfully familiar. At times, it almost feels as if Tasha Lem is doing a River Song impression. 2. The Church where Tasha Lem works is called the Papal Mainframe. This immediately suggests a possible connection to River, since we already know that when River died, the Doctor "saved" her to the mainframe of the computer in the library planet. But beyond that, we also know River has a deep connection to this very same Church. The second time we ever met her, she was working with the Church's warrior clerics to defeat the Weeping Angels. It was also the Church who kidnapped River when she was a baby and turned her into a psychopath in an attempt to keep the Doctor from ever coming to Trenzalore. It was the Church who put her in that astronaut suit and hatched the plan to murder the Doctor. 3. "You have been fighting the psychopath inside you all your life." The Doctor says those words to Tasha Lem as a reminder that she can fight the Dalek inside her, too. River Song, as mentioned above, is the other person we know who has to fight her psychopathic tendencies. 4. The Doctor also insults Tasha Lem and starts an argument with her in order to snap her out of being controlled by the Dalek inside her. "You never could resist a row," he says. That sounds a lot like River, too. 5. The Daleks say they killed Tasha Lem "several times" while they were trying to get information from her. That suggests she might be able to regenerate — an awfully rare ability. We already know River Song can regenerate thanks to being "a child of the TARDIS." 6. Tasha Lem can fly the TARDIS. "Flying the TARDIS was always easy," she tells Clara. "It was flying the Doctor I never quite mastered." There aren't many people who can fly the big blue box — but River Song was a natural at it, too. 7. The Doctor says Tasha Lem is "against aging." We already know that's one of River Song's character traits. In "The Angels Take Manhattan," she tells Amy that you need to hide the signs of your aging in order to keep the Doctor interested. 9. River Song is also known as Melody Pond, or Mel. Lem is Mel, backwards. There were, however, a few signs this theory might not be right. Most notably, the first time Tasha Lem sees the Doctor she makes a remark about his "new body." River, of course, has met the Eleventh Doctor plenty of times. His body is not new to her. And the Doctor already knows Tasha Lem when they meet at the beginning of the Christmas special — but it's unclear when that could have happened if Tasha is a future version of River. It will be very interesting to see if the question is answered when the show returns next fall. And either way, they seem to have fascinating new character in Tasha Lem. I've got a few more thoughts on the Christmas special here and the 50th anniversary special here. Or learn about the Torontonian who created Doctor Who here. Quote: "The Church where Tasha Lem works is called the Papal Mainframe. This immediately suggests a possible connection to River, since we already know that when River died, the Doctor "saved" her to the mainframe of the computer in the library planet." My Thoughts: Ah... but did we forget that Tasha Lem officially changed the core tenets of the Papal Mainframe's constituent chapters so that they became dedicated to ensuring that silence would fall in response to the question, turning the Papal Mainframe into Church of the Silence. AND when did River Song "die", the two part episode of "Silence in the Library and, Forest of the Dead". THE CHURCH OF THE SILENCE.... Does this not also strike a cord to River Song? River gave all her regenerations to the Doctor to save him after she killed him in "Let's kill Hitler." So she can't have regenerated into Tasha Lem. "The first time Tasha Lem sees the Doctor she makes a remark about his 'new body.'" Ah, but to quote "The Wedding of River Song"
River: So do I. All the time. Have to. Spoilers. Pretending I don't know you're my mother. Pretending I didn't recognize the space suit in Florida. Tasha/River pretends not to recognize the Doctor to mask her identity. I feel like Tasha Lem is a pre Mel and River Song version. Because her timeline and the Doctor's seem to run opposite of each other. The first time the Doctor meets River in the library, he is youngest she's ever met him but River is at the end of her life. I really hope they explain this all next season. I want more River Song. I wish she were Alex Kingston but I will take River in any of her bodies. I agree that Tasha Lem seems to be an earlier version, pre-Mel. River must have used several lives before she "used up all her regeneration energy" to save the doctor. We've only seen three/possibly four incarnations of Mel/River - baby Melody, which we always assumed was the same little girl we see in Day of the Moon, but that was never stated; Mel, and River. I always wondered where the rest of her regeneration energy went. And if the Daleks killed her "several times," then it seems obvious that she must be Time Lady. Also, remember how she says that they keep meeting in the wrong order, and how he says that she probably doesn't remember killing him? What else doesn't she remember? It seems that Tasha Lem must be an incarnation before the little girl in Day of the Moon, and after baby Melody. Also, because they keep meeting in the wrong order, I think Tasha must have known Peter Capaldi's doctor, or a different future incarnation. At one point, River tells 10 that he's "so young, younger than I've ever seen you." That lines makes a lot more sense under these circumstances. As well as her surname being Mel backwards it seems very strange that her first name is Tasha. Tasha means "born at Christmas" which seems a strange co-incidence given the name of the town they are battling over. Tasha Lem is an anagram for La Thames = French (feminine) The + A River in England = The River!!! She can not be the Doctor because of a few reasons. 1.) She states off the bat "Oh you have a new body, give us a spin" If she was River she would have known who the doctor was. 2.) She states to the doctor "we created an assassin to kill you" If she was River why would she make such a statement. 3.) if she was River song , she wouldn't threaten to destroy the planet if the doctor spoke his name because River song was all about humanity as the doctor was. she also would have known the name of the doctor already. 4.) River states to the doctor that she was taught how to fly the tardis by someone and continues to say it wasn't the doctor. the Only person that could have taught her how to use the Tardis is Lem. 5.) When the doctor was about to die she was no where to be found. If she was River she would have had a Good bye to the Doctor. instead of picking up Clair. 6.) If she was River then she would have remembered falling in love with the Doctor so there would have really been no point in genetically making her past self an assassin to kill the doctor. if she wanted to stop the events from happening she wouldn't have had River been kidnapped she would have just let things play out normally. *There are so many reasons why Tasha isn't River. when I think of more I will post them. But Lem is in no way River. Assume that Tasha is River for a moment.... River's timeline runs backwards, so what if this is the first time she is seeing 11 before he regenerated into 12? Just like Silence in the Library which was the first time she saw 10 before he regenerated into 11. Tasha = Natasha = Anastasia which means resurrection. So Tasha Lem is the resurrection of Melody. First of all Tasha cant be a past regeneration of River... When Melody is a child and she escapes from the space suit, and regenerates. She finds her parents who are also children at the time, and grows up with them. She stays in that form till she finds the doctor in "Let's kill Hitler" where she regenerates into her final form River-Song. I'm only seeing wild conjecture here (in the comments section). Anagrams that are so far-fetched that they can only be the result of wishful thinking. Random pieces of illogical thinking that serve the same purpose. However, I do agree that there are too many clues for a mere coincidence. I got exactly the same impression when I saw the episode. We'll have to wait and see!